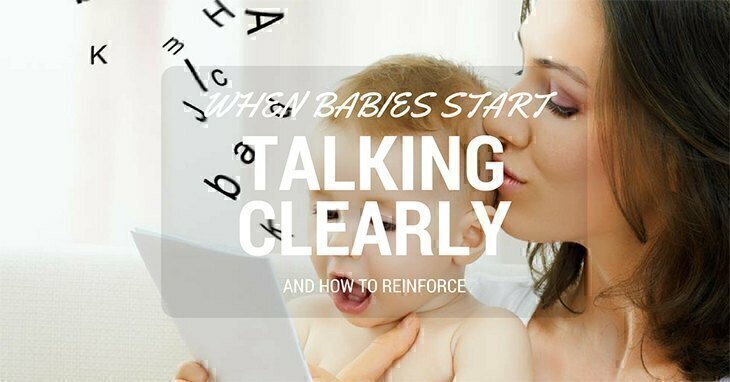 Have you ever wondered when do babies start talking clearly? I’ve always been excited to reach that milestone. Not only because I want to hear my baby say adorable things but I found it vital when asking them how they feel when they’re sick. Case in point, when they’re incessantly crying, and you have no idea if they have tummy pain or a toothache. For this reason, I taught my little boy the most core body parts like “belly” and “teeth”. Also, my mum often told me little boys were a bit delayed when it comes to their speech development. Here, we’ll find out if it’s true. Keep in mind that learning how to speak is a long process and there are several factors at play here. The thing is, don’t compare your child to others. Just because they can’t pronounce as well or talk as much like your friend’s kids doesn’t automatically mean delayed. Before you can conclude they are behind their development, it first has to be determined by a medical professional. It’s a lot like walking. They need to sit without support, crawl slowly, pull themselves up, hold onto and cruise along furniture and of course, take a few stumbles. The same thing goes for talking. They need to find their voice, learn how to construct the words, and understand the meanings before they can build sentences and initiate conversations. Six Months: They’ll start to understand that their name refers to themselves. They will likely turn to you when you call them. Nine Months: They start to discover and use various tones of voice. It may seem like they're shouting but they're just exploring how they can control the intonation. 11-12 Months: This is when they’ll start to say their first understandable words, it’s usually something they hear often. For me, it was about 11 months when my son started calling his father, “Da!” Yes, I know. I felt jealous at the time. Other common words they might use include “Hi” or “Bye. 13-18 Months: They can now understand and obey simple commands and requests like “Put it back” or “Don’t throw your food.” However, they’re also likely to disregard them too just because they want to feel in control. 19-24 Months: It’s at this age when they suddenly have what linguists like to call ‘language explosion.’ The past few months, there aren’t that many words they could utter. And suddenly, it’s like they already know the names of almost everything. Remember, they’re watching and listening intently so be mindful of the words that come out of your mouth since they’ll likely repeat it to someone else later on. Also, they can now string two-three words. It gets more fun to talk to them because you can now have conversations. What I liked about this stage is you can ask them questions, and they can answer back. Three Years Old: Their vocabulary has expanded, and they have a better understanding of spatial concepts. Plus, their comprehension also increases by this time. 1. Talk and talk often: I never believed in ‘baby talk’ when it comes to communicating with your little one. They won’t learn the right words with corresponding meanings if you stoop down to the level of babbling. What my husband and I did when my boy was just a few months old was talk to him like an adult. Sometimes, when it’s just my baby and me, I’d tell him about my day. I’d also share the books I recently read or movies I just watched. Notice how they look at your mouth like they’re trying to figure out the shape of your lips when you talk and how you form the words. 2. Sing nursery rhymes and read books: Introduce them to reading materials early. You can start with cloth or board books which they can flip all by themselves and not tear easily. They will especially love the different intonations so make sure to use various tones and voices when reading to them. 3. Learn to listen: Communication is not a one-way street, always remember that. Babies need to feel that you value their ‘voice’ too. Listen attentively when they’re talking even if it’s not yet comprehensible.They will love the attention and focus, and it will further propel them to improve their speech. 4. Limit TV time: I have a very firm stance on letting kids younger than two years old watch cartoons or other shows on the television or their iPad. It has detrimental effects not just on your baby’s speech but also their social skills. 5. Cheer your kids on: Nothing will encourage them more than positive reinforcement. If in case, you see them struggling to form the words, urge them and if you can, don’t provide it for them. Don’t interrupt them mid-sentence. That will only be frustrating. Again, I’d like to reiterate that you shouldn’t rush talking. It’s a process like everything your baby learns. Although some studies suggest that boys fall just a little bit behind girls when it comes to speech, you can still help them develop their vocabulary. Trust me; it’s so rewarding to hear their first words! Have anything else to add? Share in the comments! Right now, you should also visit this article about other milestone in the development of children as: when can baby sit in high chair?